HOVER MOTOR COMPANY: Lakeside Speedway. Go there. Lakeside was relocated to its current location on Wolcott Drive in 1988 when the Woodlands horse and dog track took over the original site. The new track had an asphalt surface, and the NASCAR Weekly Racing Series it hosted there was a breeding ground for drivers such as Jamie McMurray. Others, such as Jeff Gordon, Jason Leffler, and J.J. Yeley took to the 3/8th-mile oval in USAC Sprint Car and Midget shows. One of the most infamous events at the track was when World of Outlaws standout Doug Wolfgang was seriously injured and burned in 1992. The track was also completely submerged when the Missouri River overflowed its banks during the big flood of '93. The big flood had more of an impact than it may have first appeared. Even after cleanup was completed, the asphalt track surface suffered from "weepers", or water that seeped up through the seams on the track. This caused several canceled shows, even on perfectly sunny days after a rainstorm. Eventually that, plus the continued void in dirt track racing in the area that was left when the old track closed, prompted then general manager Marc Olson to cover the asphalt surface with clay for the 2000 season, bringing dirt track racing back to Kansas City, Kan.
Lakeside thrived for several years with the dirt surface, but the 2011 season looked like it would be the track's undoing. Flooding in the northern part of the U.S. brought about a highly publicized disaster all along the Missouri river. Levees were being breached, and many towns, farms, and roads paid the price. Massive flooding was destroying acres of land and property. As you may have guessed, Lakeside was one of the casualties. With only a couple of races under its belt, the U.S. Army Corp of Engineers forced track personnel to evacuate, and within weeks, the property was again underwater. As the water subsided, fans, officials, and other volunteers went to work on Lakeside, repairing, painting, and replacing everything that was damaged in the flood. This was a huge job, and it impacted everything from the electrical system to the track surface itself. 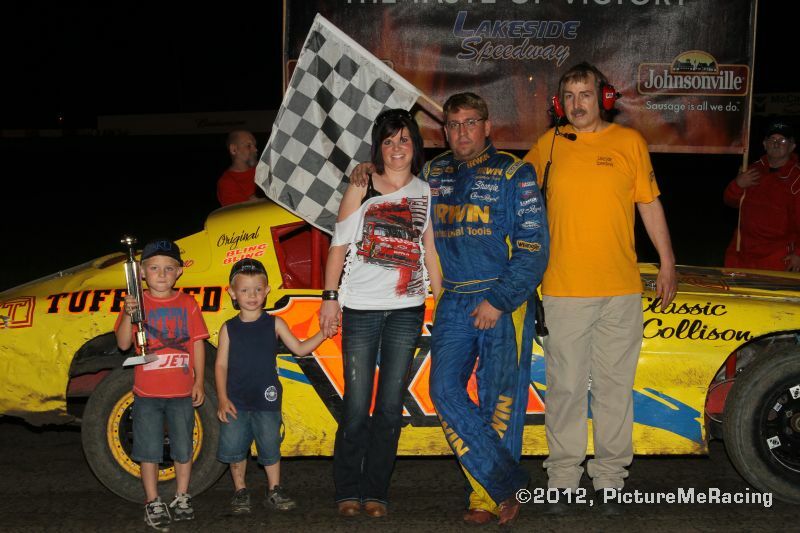 Amazingly, the hearty racing family had the severely damaged track ready to go, and the 2012 season started on-schedule. I was at the track Friday for Joslin's Jewelry Night at the Races, and as usual, I watched some incredible action. Anyone who watches the stuff on TV and thinks that stock car racing is just a bunch of guys leisurely tooling around in circles obviously hasn't been to a track like Lakeside. There is action from the start of hot laps clear through the last feature. Lakeside currently runs four classes of cars, and the winners on Friday night were Scotty Moore in the Factory Stock Class (driving a great-looking 1970s Camaro in a sea of Monte Carlo-bodied stockers), Nick Newton in the B Modifieds, longtime budget racer Marshall Jewett in the Grand National Class (his car is sort of home-painted to resemble a purple '60 Corvette! 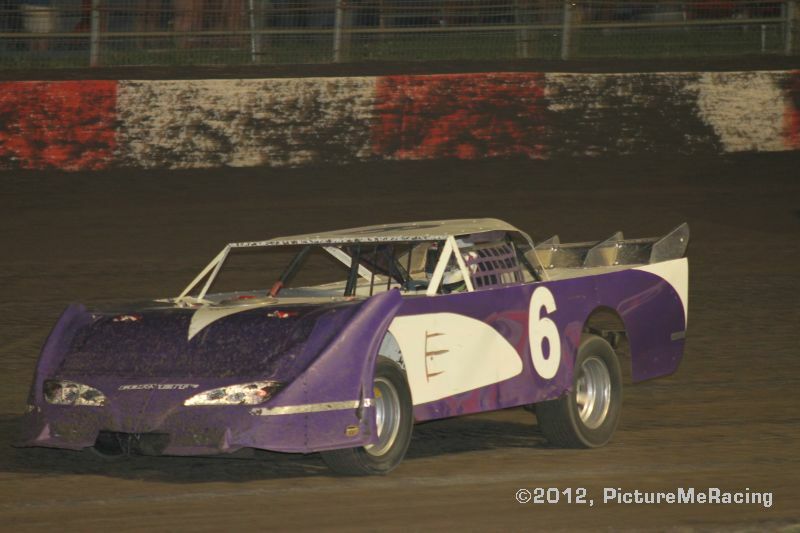 ), and Cody Agler in the extraordinarily competitive Modified class. I snapped lots of pictures from the grandstands and in the pits, and Picture Me Racing also furnished us with some winner's photos. Check them out in the slideshow below. But for the real thing, you really should attend a race at Lakeside some Friday night. Check out http://www.lakesidespeedway.net/ for more information.